This is what we had for our Christmas breakfast. I figured we would be eating a little bit later in the morning, so I knew I would have enough time to throw it together. I made it in 8 little ramekins and cooked 6 in the water bath and 2 without the water bath, just to see what the difference was. 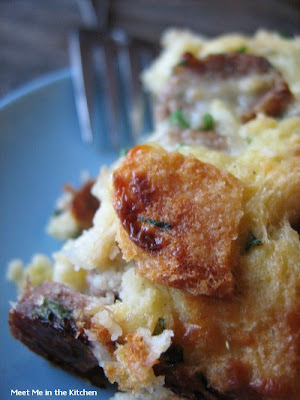 The water bath definitely makes this more like a bread pudding and without it, it is more like a strata. Either way, it tasted really good. My husband absolutely loved these and that pretty much is a guarantee that anyone will like them. 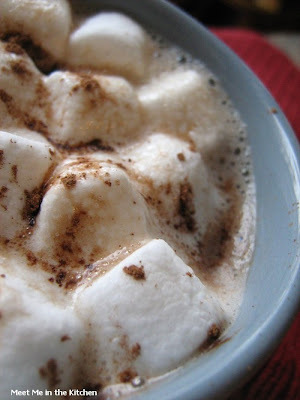 The hot chocolate was a great way to start off the morning. It was very spicy and I wasn't sure if I liked it at first, but after a few more sips, I was sold. My family was a little divided, half of us really liked it, the other half, not so much. It was a fun breakfast anyway! Happy New Year's Eve- Have fun tonight! Cut a 3-inch tip from each asparagus spear, reserving the stalks for another use. Cut asparagus tips into 1/2-inch pieces. Heat oil in a nonstick skillet over medium-high heat. Add onion; saute for 5 minutes or until tender, stirring frequently. Add asparagus; cover and cook 4 minutes, stirring once. Remove from heat, and set aside. Coat 6 (10-ounce) custard cups or ramekins with cooking spray; place in a large baking pan. Place bread cubes evenly into custard cups. 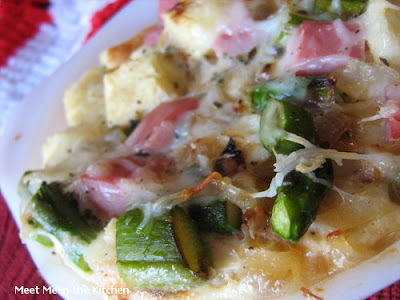 Top evenly with asparagus mixture, ham, and cheese. Combine milk and remaining ingredients, stirring with a whisk. Pour evenly into custard cups; let stand 20 minutes. Add hot water to pan to a depth of 1 inch. Cover and bake at 375° for 30 minutes. Uncover and bake an additional 15 minutes. Let stand 10 minutes before serving. Combine first 3 ingredients in a medium saucepan; cook over medium-high heat until sugar dissolves and is golden (about 5 minutes), stirring frequently. Remove from heat; cool slightly. Stir in milk and syrup; cook over medium-low heat, stirring with a whisk. Heat to 180° or until tiny bubbles form around edge of pan, stirring frequently (do not boil). Strain mixture through a sieve; discard solids. 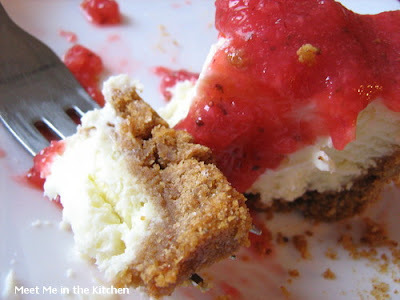 This week's Tuesdays with Dorie recipe, Tall and Creamy Cheesecake was chosen by Anne Strawberry. You can find the recipe over at her blog. I almost didn't get any pictures of this one and had to settle for a half eaten piece, of which the top layer of cheesecake had been eaten and more sauce was added on top. I almost had to beat people and banish them from the kitchen, when I was making this so it could cool and rest in the fridge overnight. Cheesecake is popular around here. I decided to flavor the batter with key lime juice (which I had in the freezer from my last key lime cheesecake experience), lime zest and I made a fresh strawberry sauce. It was our Christmas dinner dessert and everyone loved it. I also made it with all sour cream and did away with the water bath. Yummy! 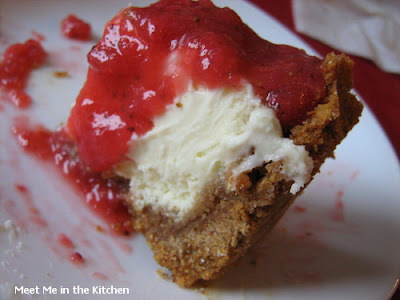 Go check out the Tuesdays with Dorie blogroll to see all the other delectable cheesecake variations! Process all ingredients in a food processor until smooth, stopping to scrape down sides. 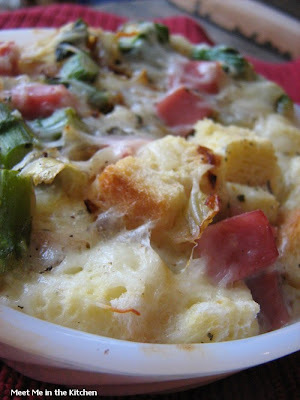 Come Back Tomorrow for- Asparagus, Ham, and Fontina Bread Pudding and Hot Chocolate with a serious kick! I hope everyone had a great holiday break. We got a ton of snow and have been a little stir crazy. It is freezing outside and I am ready for a break in the weather. Somehow, something with the word tropical in the title, is really appealing to me right now. I can just start to dream about warm weather. I really should live somewhere that is warm and balmy all year round. I just can't take this cold stuff anymore! Oh, well. I can dream, right? I received some dried kiwi in the mail a couple of weeks ago from Oh! Nuts and I have been wanting to use it in some kind of baked good. These muffins were the perfect thing. I had ripe bananas and a ton of macadamia nuts, so I decided to mix these up and throw in about a cup of chopped, dried kiwi. 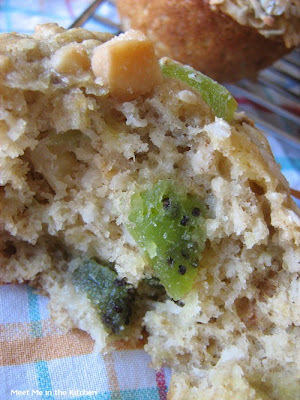 The kiwi added a nice little surprise inside and these muffins disappeared quickly. Another batch is going to be made by demand! 2. To prepare muffins, lightly spoon flour into dry measuring cups; level with a knife. Combine flour and next 4 ingredients (through salt) in a large bowl. Make a well in center of flour mixture. Combine banana and next 5 ingredients (through egg) in a medium bowl; add to flour mixture, stirring just until moist. Stir in pineapple, 1/3 cup coconut, and 3 tablespoons nuts. Spoon batter into 12 muffin cups coated with cooking spray. 3. To prepare topping, combine 2 tablespoons coconut and the remaining ingredients in a small bowl. 4. Sprinkle about 1 teaspoon of topping over each muffin. 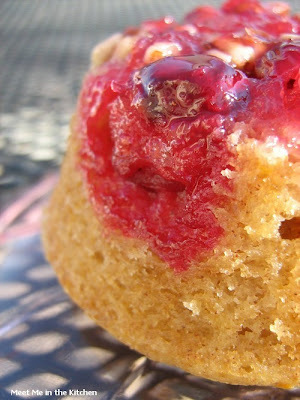 Bake at 400° for 18 minutes or until muffins spring back when touched lightly in center. 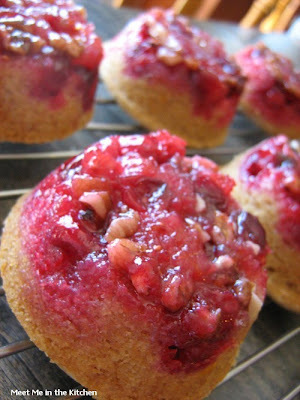 Remove muffins from pans immediately; place on a wire rack. 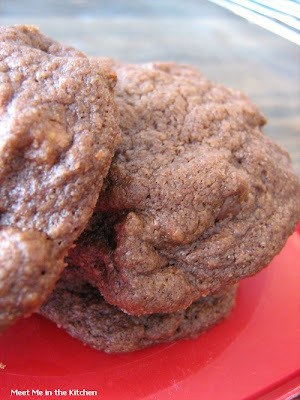 This weeks Craving Ellie in my Belly recipe- Triple Chocolate Cookies, was chosen by Gabi of The Feast Within. 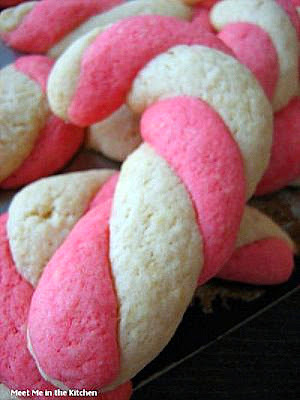 I made these along with a few other cookies and sent them on Christmas plates, so I don't really have too much of a review. They weren't very pretty to look at, but the family member who got to taste one, said they were good. Plus they are on the lighter side, which is always nice at this time of year. I won't bore you with anything else- hope you had a Merry Christmas and continue to have a great holiday! In a large bowl, mash together the butter and sugars with a fork until well combined. Add the oil and egg and beat until creamy. Mix in vanilla. In a medium bowl, whisk together the flours, cocoa, and salt, if using. Add the flour mixture to the butter mixture and mix well. Stir in both chocolates and, if desired, the pecans, and mix well. Using a tablespoon, scoop the batter onto a ungreased cooke sheet. Bake until the cookies are just set, about 12 minutes. Transfer the cookies to a rack to cool. Store the cookies at room temperature in an airtight container, where they will keep for up to 4 days. Today is my birthday, so I thought I would share 2 mini desserts that I tried recently. They both come from Dorie Greenspans- Baking:from my home to yours and I took both of them to a recent gathering. The Cranberry Upside Downer was supposed to be a 8-inch round, but I made it in a muffin tin, so the servings would be smaller and I got 14 mini-cakes. I also used my mini-bundt cake pan for the Milk Chocolate Bundt cakes and got 15 of them. So, if you need a mini treat, try one of these. Merry Christmas Eve to everyone and Happy Birthday to Me! Center a rack in the oven and preheat the oven to 350F. Put a 8X2 inch round cake pan on a baking sheet.Whisk together the flour, baking powder, salt and cinnamon. Melt 6 TBSP of the butter in a small saucepan. Sprinkle in 6 TBSP of the sugar and the zest of 1 orange and cook, stirring, until the mixture comes to a boil. Pour this evenly over the bottom of the cake pan, then scatter over the nuts and top with the cranberries, smoothing the layer and pressing it down gently with your fingertips. Set aside. Working with a stand mixer, preferabley fitted with a paddle attachment, or with a hand mixer in a large bowl, beat the remaining stick of butter on medium speed until smooth. Add the remaining 1/2 cup of sugar and continue to beat until pale and creamy, about 3 minutes. Add the eggs one at a time, beating for 1 minute after each addition and scraping down the bowl as needed. Pour in the vanilla and zest of 1 orange. Reduce the mixer speed to low and add half of the dry ingredients, mixing only until they disappear into the batter. Mix in the milk, then the rest of the dry ingredients. Spoon the batter over the cranberries and smooth the top with a rubber spatula. Bake for 40-45 minutes, or until the cake is golden and a thin knife inserted into the center of the cake comes out clean. Remove it from the oven and run a blunt knife between the sides of the pan and the cake. Carefully turn the cake out onto a serving platter. If any of the berries stick to the pan-as they might-just scrape them off with a table knife and return them to the cake. 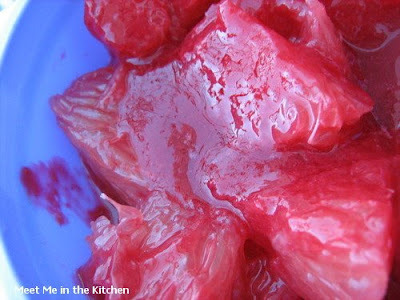 Warm the jelly in a small saucepan over low heat, or do this in a microwave oven. Gently brush the glaze over the hot cake. Center a rack in the oven and preheat to 350 degrees F. Generously butter a 6-mold mini bundt pan. Make the swirl by tossing the nuts, cocoa and sugar together in a small bowl. Beat the butter and sugar together on medium speed until smooth, about 3 minutes, scraping down the bowl as needed. Add the egg and beat for 1 minute more, then beat in the vanilla. Don't be concerned if the mixture looks curdled-it will smooth out soon. Reduce the mixer speed to low and add half the flour mixture, mixing only until it is incorporated. Add the milk, and when it is blended into the batter, add the remaining flour mixture, again mixing just to incorporate. Finally, add the melted chocolate and mix to blend. Fill each of the mini Bundt molds with a little batter, then divide the swirl ingredients evenly among the molds and top off the Bundts with the remaining batter. Bake for 20 to 22 minutes, or until a thin knife inserted into the center of the cakes comes out clean. Transfer the pan to a rack and allow the cakes to rest for 5 minutes, then invert them onto the rack and let them cool to room temperature. 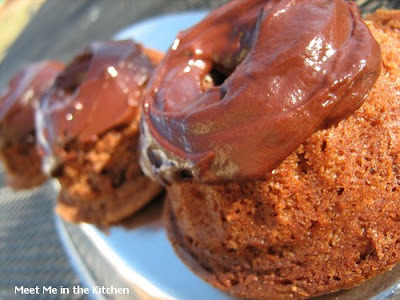 To make the glaze, melt the chocolate in a heatproof bowl over a saucepan of water or in a microwave oven. Stir in the corn syrup. 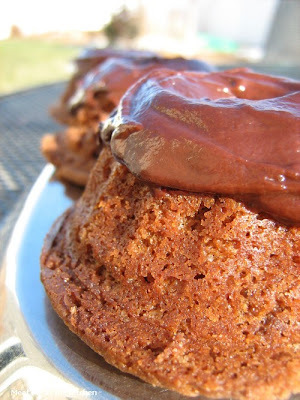 Using a small offset metal spatula or knife, spread the shiny glaze over the tops of the Bundts. Matt's birthday cake last year-Red Velvet Peppermint Cake- so Yummy! Today is my husbands birthday- I am a lucky woman. 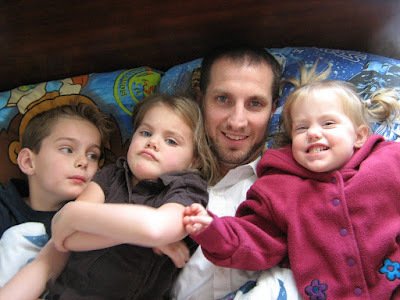 My Matt is a great husband and father, who loves his family, his work and makes the world a better place. He is happy, fun-loving and just a wonderful person. I could go on all day about how great he is. Seriously- I am so glad that we found each other! It is kinda fun, because his birthday is today and mine is tomorrow. We are both Christmas babies, that came home in giant stockings. In his honor, I made one of his favorite cookies. My hubby could keep a few places and products in business, all by himself. Of course, McDonalds, but also Girl Scout Cookies. He buys quite a few boxes each year and has no problem downing a box at a time. I try not to get mad, because he has the metabolism of a teenage boy, so it doesn't affect him at all. I have to keep my eyes away from the cookies, because if I even look at them, I will gain at least a pound. 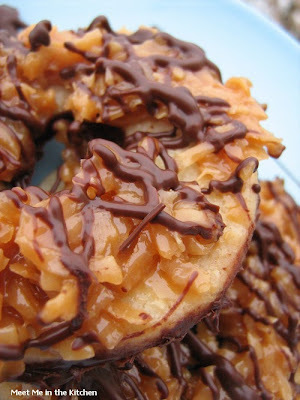 I saw these Homemade Samoas over at I heart food 4 thought, and I have mentioned before, how much I love Clara's blog. She has so many great recipes! These cookies were a little time consuming, but worth the effort. I used semi-sweet chocolate to dip them in and for the drizzle and my hubby told me next time to use milk chocolate. 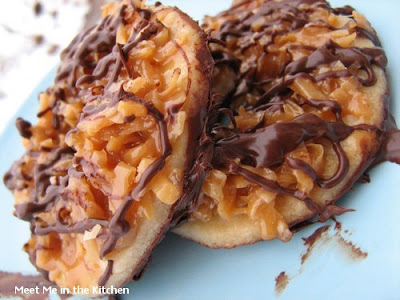 If you have a Samoa lover in the house, these cookies will make them very happy! Happy Birthday, Matt~ I love you! To make cookies—Preheat oven to 350F. In a large mixing bowl, cream together butter and sugar. Mix in flour, baking powder and salt at a low speed, followed by the vanilla and milk, adding in the milk as needed to make the dough come together without being sticky. The dough should come together into a soft, not-too-sticky ball. Add in a bit of extra flour if your dough is very sticky. Roll the dough (working in two or three batches) out between pieces of wax paper to about 1/4-inch thickness and use a 1 1/2-inch cookie cutter to make rounds. 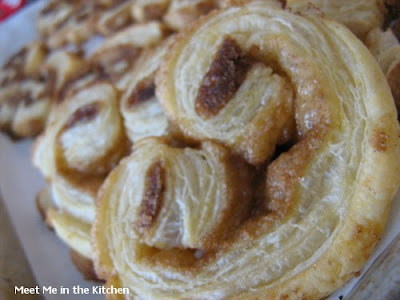 Place on a parchment lined baking sheet and use a knife, or the end of a wide straw, to cut a smaller center hole. Repeat with remaining dough. 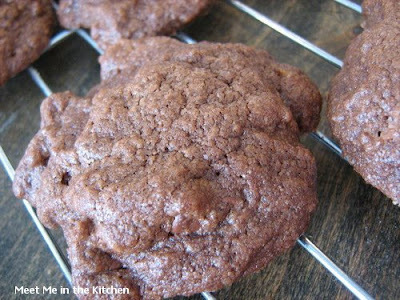 Bake cookies for 10-12 minutes, until bottoms are lightly browned and cookies are set. 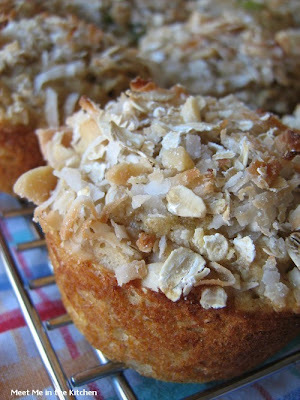 Spread coconut evenly on a rimmed baking sheet and toast 20 minutes, stirring every 5 minutes, until coconut is golden. Cool on baking sheet, stirring occasionally. Set aside. Coming Tomorrow- My Birthday- 2 Christmas Eve Treats! 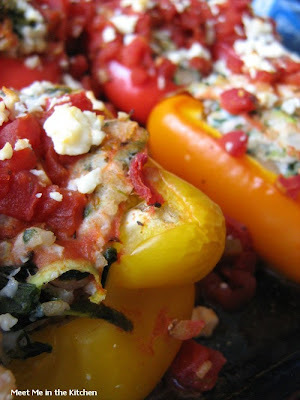 The other day I noticed that I had a little bulgur and some feta I needed to use and 6 gorgeous peppers, so I turned to The Food You Crave and found a recipe for Greek-style Stuffed Peppers. I made a couple changes to the recipe- I used ground turkey breast instead of ground beef and added a can of cannellini beans. I was able to fill 12 pepper halves and still had a little of the meat mixture leftover, so I made some Greek WonTon cups- using Greek Seasoning to flavor them and cooked up the leftover meat mixture. 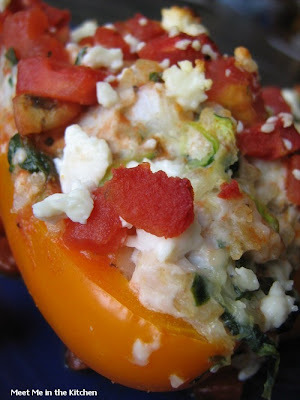 I put the mixture inside and topped them with some chopped plum tomatoes. Yum! Preheat the oven to 350 degrees F. In a large bowl, combine the beef, spinach, zucchini, beans, onion, bulgur, egg, oregano, salt and a few grinds of pepper. Mix until thoroughly combined. 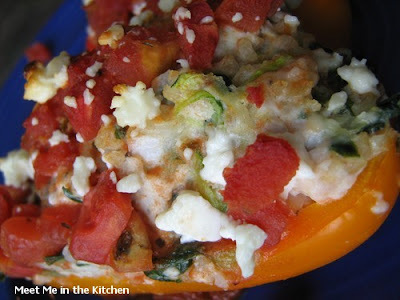 Arrange the pepper halves cut side up in a 9x13-inch baking dish and fill each pepper half with the meat mixture. 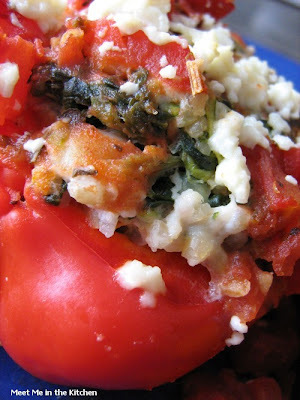 Pour the tomatoes with their juices over the peppers and sprinkle with the feta. Cover with aluminum foil and bake for 30 minutes. Uncover and bake the peppers until filling is completely cooked and the peppers are tender, about 45 minutes longer. 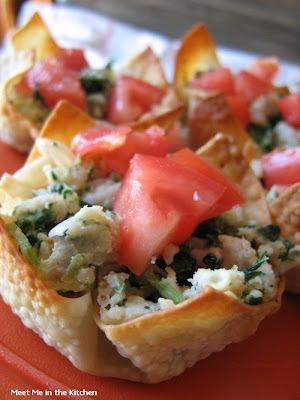 To make Greek WonTon cups- Go to this post and substitute Greek Seasoning for spice mix used. Sometimes it is nice to have a delicious breakfast, that you can prepare the night before, that will feed a number of people. 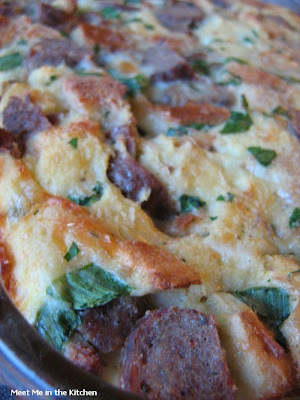 All you have to do is pop it in the oven and you have a great breakfast, in a short amount of time. 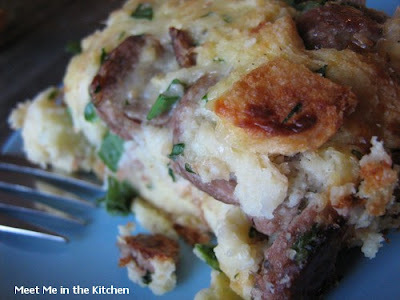 I made this breakfast casserole for a weekend breakfast and it was so, so easy to put together. I made it even easier on myself by using Jimmy Dean's Fully Cooked Turkey Sausage Links, which I buy regularly for my children. I just sliced them and threw them in with the bread cubes we had leftover from making our Thanksgiving stuffing. Since grapefruit is a readily available fruit this time of year, it is a nice addition to any breakfast, but you can jazz it up with this quick and easy raspberry sauce. 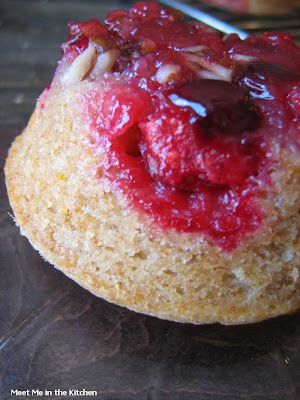 The raspberry sauce could also be made ahead and kept in the fridge overnight. If you are expecting holiday guests, this would be an easy way to keep everyone happy in the morning! In a small dish, thaw raspberries in the microwave, until completely defrosted. 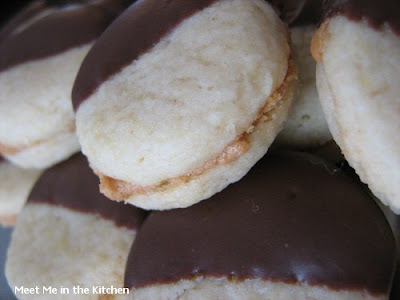 Put them in a blender or food processor with 1 tsp of sugar and process, until smooth. Taste and add a little more sugar, if needed. Press this mixture through a sieve and discard the seeds. Halve the grapefruit and remove the sections. 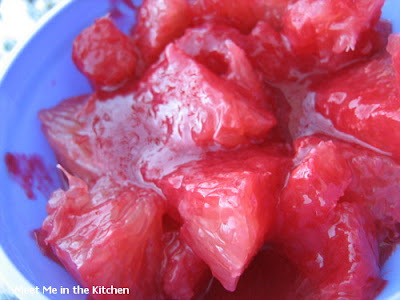 Place the sections in bowl and drizzle the raspberry sauce over top. 1. 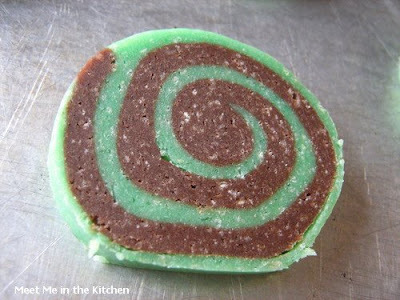 Roll Butter Cookie Dough to 1/8-inch thickness on a floured surface. Using a round cutter, cut out circles and place on greased baking sheet. Bake at 375 degrees F 7 to 9 minutes, or until lightly browned. Cool on a wire rack. 2. 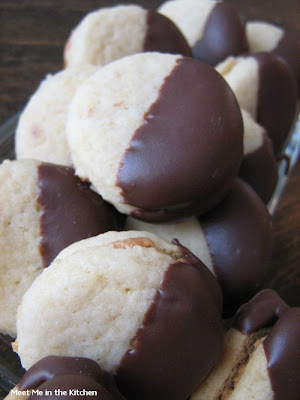 Combine 1/3 cup peanut butter with 1/3 cup confectioners sugar. Spread mixture on the bottoms of half of the cooled cookies, placing bottom to make a sandwich. 3. Melt 6 oz. semi-sweet chocolate chips (I used candy melts) in a bowl in the microwave on high. Stir every 30 seconds, until smooth. 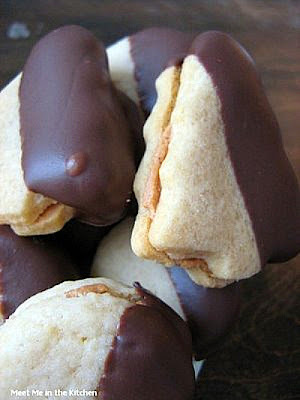 Dip sandwiches halfway into chocolate. Cool on waxed paper. Craving Ellie- MY PICK!!! 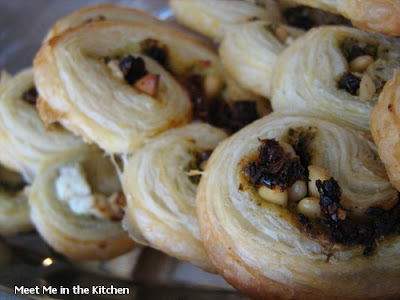 Curried Butternut Squash Soup and Barefoot Bloggers Bonus- Savory Palmiers, heck why not some Cardamom ones too? 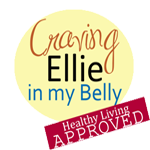 This week's Craving Ellie in Your Belly recipe was chosen by yours truly, Me. 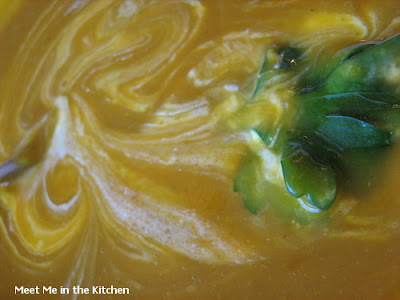 I wanted to try her version of Butternut Squash Soup, which is Curried. So, since butternut squash season is upon us, I chose it. I really like this soup, but keep in mind I love butternut squash and I also love curry powder. Some people reported that the honey made this a little too sweet, so I experimented and left the honey out of half of my soup. I liked it both ways, but better without the honey. I used greek yogurt on top, which really helped to calm down a little of the curry. This is a spicy soup and was just what this house of sore throats needed. 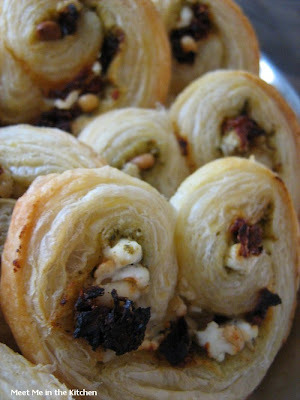 The Barefoot Bonus recipe for this week was Savory Palmiers, from Ina's new book, Back to Basics. It was chosen by Becky of Random Musings of a deco lady. 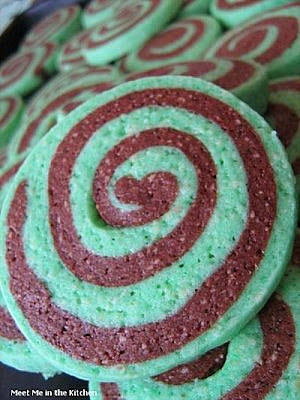 This recipe looked really easy and pretty, so I threw it into the cookie plates that I took to a few people in the neighborhood. I also saw these yummy Cardamom-Brown Sugar Palmiers in Sunset magazine and they reminded me of my favorite pastry that I ate when I spent 18 months in Estonia. I decided to do a half batch of each, so I had some savory and some sweet. 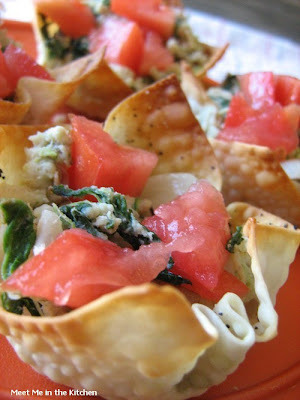 Super simple, elegant and delicious! Heat the oil over medium heat in a large soup pot. Add the onion and garlic and cook, stirring, until softened, about 5 minutes. Add the squash, broth, curry powder, and salt and bring to a boil. 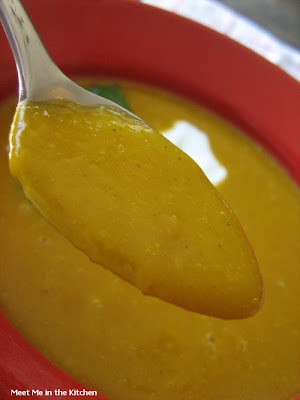 Reduce the heat to medium-low and simmer, until the squash is tender, about 15 minutes. 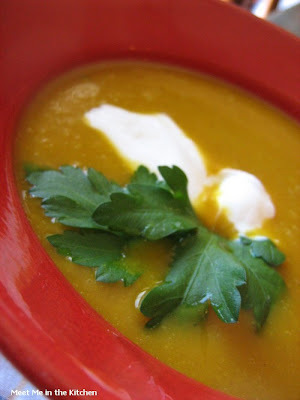 Remove the soup from the heat, stir in the honey, and puree until smooth in the pot using an immersion blender or in two batches in a regula blender. Taste and season with salt, if necessary. 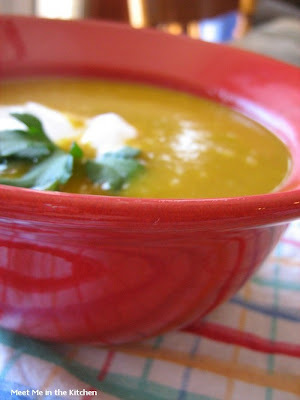 To serve, ladle the soup into serving bowls and drizzle with the yogurt. Lightly flour a board and carefully unfold one sheet of puff pastry. Roll the pastry lightly with a rolling pin until it’s 9 1/2 x 11 1/2 inches. 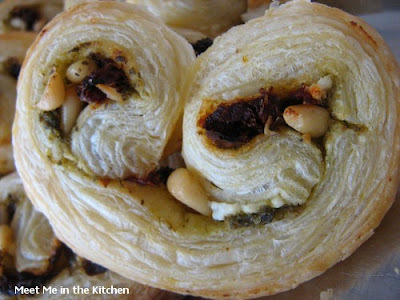 Spread the sheet of puff pastry with half the pesto, then sprinkle with half the goat cheese, half the sun-dried tomatoes, and half the pine nuts. Sprinkle with 1/4 tsp salt. Working from the short ends, fold each end halfway to the center. Then fold each side again toward the center until the folded edges almost touch. Fold one side over the other and press lightly. Place on a sheet pan lined with parchment paper. Repeat for the second sheet of puff pastry using the remaining ingredients. Cover both rolls with plastic wrap and chill for at least 45 minutes. Cut the prepared rolls of puff pastry into 1/4-inch-thick slices and place them faceup 2 inches apart on sheet pans lined with parchment paper. Bake for 14 minutes, until golden brown. Serve warm. Place the walnuts, pine nuts, and garlic in the bowl of a food processor fitted with a steel blade. Process for 30 seconds. Add the basil leaves, salt, and pepper. With the food processor running, slowly pour the olive oil into the bowl through the feed tube and process until the pesto is finely puréed. Add the Parmesan cheese and purée for a minute. Serve, or store the pesto in the refrigerator or freezer with a thin film of olive oil on top. Time: 30 minutes, plus chilling time. Bakers' Tip: As with any super-buttery dough, chilling it makes it much easier to slice. 1. Combine brown sugar and cardamom in a small bowl. Unfold dough flat on a work surface and sprinkle evenly with half the sugar mixture. 2. Using a rolling pin, lightly roll sugar into dough so that most of sugar sticks, being careful not to change the shape of the dough. Turn pastry over and sprinkle evenly with remaining sugar. 3. Beginning with the side closest to you, fold in dough, 1 in. at a time, to the center of the rectangle. Repeat with the opposite side. Fold one half on top of other as if closing a book. Wrap dough airtight and chill at least 1 hour. 4. Preheat oven to 400°. Using a sharp knife, cut dough into 1/2-in. slices. Line 2 baking sheets with parchment paper and lay slices on flat sides about 2 in. apart. Bake slices until doubled in size and golden, about 10 minutes. Let cookies cool completely on trays. Make ahead: Unbaked palmiers can be frozen up to 2 weeks; baked palmiers may be made up to 2 days ahead and kept airtight at room temperature.